Samsung announced the new Galaxy A8s in China yesterday and while the device's Infinity-O camera hole may be the biggest talking point, an even bigger point of contention is the fact that the phone lacks a 3.5mm jack. This will be the first time Samsung has removed the headphone jack from a mainstream phone. Samsung announced its new Galaxy A8s in China yesterday. Devices outside the company’s Galaxy S line are generally not worthy of much attention, as they traditionally haven’t offered anything special, relative to the competition. The A8s is a special case, though—the device is the first to feature Samsung’s new Infinity-O display, a design technology that will also be seen on the much-awaited Galaxy S10 next year. The Infinity-O may have been the A8s's biggest draw but there’s yet another surprising bit of news on the Galaxy A8s: It lacks a headphone jack. Samsung, alongside fellow South Korean manufacturers LG, has been the last defenders of the 3.5mm jack, and it’s shocking that the company has started removing the port from its mainstream smartphones. Before the A8s, the only Samsung phones to have ignored the jack were the W2018 and the W2019 clamshell phones, which aren’t sold in most of the western world. Removing the jack on the A8s does raise a few questions, most notable of them being whether the S10 will also go down the same path. 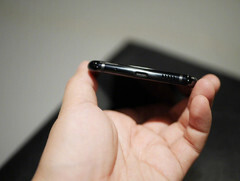 Rumors until now have been inconclusive about the presence of the 3.5mm jack on the S10 phones—credible leakers have claimed the flagships will feature a jack, while there have also been rumors that an S10 prototype without a jack is in the works. Considering how Sony is set to reintroduce the headphone jack on the Xperia XZ4 Compact, it’d be a shame to see Samsung take it away at this point. Hopefully, they don't.